Crossover India is an international non-profit organization dedicated to impacting the education rates of marginalized communities in India through the use of basketball as a vehicle of change. Meet Shilpa Tummala and Shayna Mehta, Indian-American women that are not just grade A students, but NCAA Division 1 basketball players as well at Harvard and Brown respectively. Brown University women’s basketball rising junior Shayna Mehta spent 18 days from June 22 to July 8 in Chennai, India with Crossover Basketball & Scholars Academy, a non-profit organization dedicated to impacting the education rates of marginalized communities in India through the use of basketball as a vehicle of change. 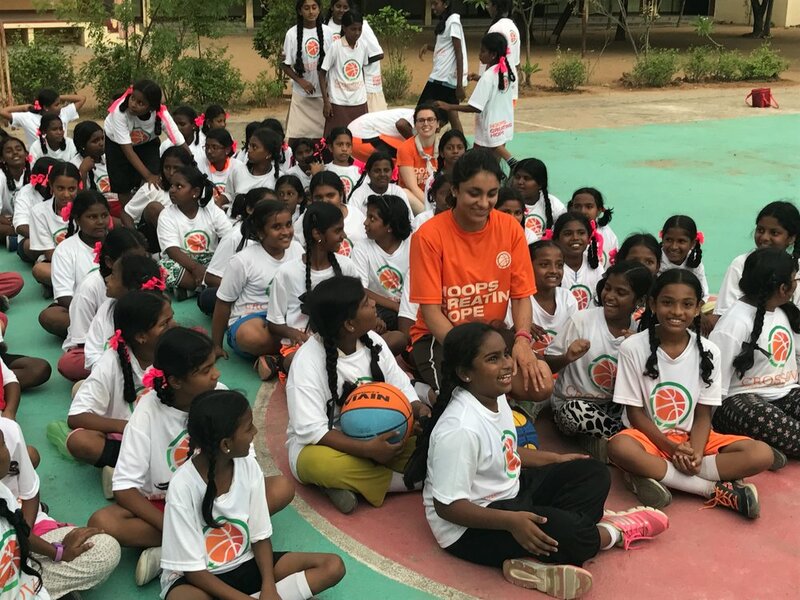 During her time in Chennai – a city of over seven million people on the Bay of Bengal in Southeast India – Mehta volunteered with Crossover’s Hoops Creating Hope program, a free, two-week program for students ages 8-14. The program aims to develop a link between the organization’s five pillars – leadership, gender equity, character, teamwork, and communication – and academic success and future goals. BrownBears.com caught up with Mehta upon her return to the U.S.
How did you initially become involved with Crossover, and what made you decide to volunteer with the organization? I initially heard about Crossover Basketball & Scholars Academy through Shaun Jayachandran when Shaun came to watch our away game at Harvard last year. Shaun knew Shilpa Tummala, a senior starter at Harvard. He said that it was the first time two Indian American Division-1 basketball players started and competed at this level. He met me after the game and told me about Crossover's Hoops Creating Hope program and about Crossover’s mission, and I was immediately interested! After learning more about the trip and connecting with some of the other student athletes participating, I realized I could not miss out on this opportunity. Have you traveled to India before? How was this trip different from your previous experiences? I traveled to India once before with my family when I was 11 years old for about two weeks. We traveled throughout India, visited family, stayed in nice hotels, and saw many of the famous tourist attractions in both northern and southern India. It was a great vacation and I wanted to come back and visit again! My trip this year, however, was much different. I did not travel freely, but stayed only in Chennai, with the other student-athlete volunteers. It was not a vacation by any means, but nevertheless, my three-week trip was amazing, although a bit exhausting! After a few days in Chennai, I did not feel like a tourist, but like my fellow volunteers, felt a real purpose for being there. I made new friends and learned much more about Indian culture than in my previous trip. I enjoyed interacting with the kids, being welcomed into their homes and seeing how they lived. I learned more about their day to day lives than I could have ever imagined. What was a typical day like for you as a part of the Hoops Creating Hope program? A typical day for a Crossover coach began with breakfast followed by a team meeting where we went over our assigned stations for the day and a review of our lesson plans. The lesson plans revolved around the five “pillars”: Leadership, Communication, Gender Equity, Teamwork, and Character. After the morning meeting, we had a few hours to explore the city and visit different tourist sights, NGOs, and other schools around Chennai. We visited Mahabalipuram (a UNESCO World Heritage site famous for its 1000+ year old Hindu rock temples), Dakshina Chitra (a living history museum), downtown Chennai, and the Pondy Bazaar. Camp would start after school at 3:30pm and go until 6:30pm Monday through Friday. At the beginning of camp, the pillar theme of the day was introduced and each student would be assigned to a station: basketball skills, teamwork and conditioning, yoga, and classroom. Each station lasted 35 to 40 minutes. We worked with 3 different schools: Holy Angels and St. Raphaels school which are Catholic all-girls schools, and Vidyaniketan a coed government school. Working the camps was definitely my favorite part of the day. I enjoyed bonding with the kids and seeing their faces light up when they saw us walk in. The smiles on their faces were contagious and always put me in a good mood even in the humid 105° tropical weather. Communicating with some of the kids was a struggle for me at times since I do not speak Tamil and some of the kids were not fluent in English. It was amazing however to see how we could use the sport of basketball as a means of engaging and communicating with them. After camp, we were all usually exhausted. We would eat dinner, reflect on the day, and then go to bed relatively early to recharge for the next action packed day. What did it mean to you to be seen as a role model for your students? It really meant a lot to me to be seen as a role model and I did not take it lightly. I was fortunate enough to have numerous role models in my life and to have the kids at the camp look up to me was extremely gratifying and humbling. The volunteers that were with me were all accomplished student-athletes coming from the top schools in the US. I think when these kids see young American student-athletes reach their goals they are more inclined to listen and take to heart what we are teaching. Were there any moments that it really hit home for you what your purpose was there? Seeing how some of the kids lived was an eye-opening experience for me. One day after camp we visited homes of the students from Vidyaniketan (the coed government school). One family, we visited lived in a small, cramped one-bedroom home with a tiny kitchen area separated by a thin wall. A raggedy old fan was used for cooling and the family’s clothes were organized in suitcases. It was hard for me to grasp that five family members lived in this house, as all the coaches could barely fit. Despite these conditions, it was remarkable to see how upbeat and happy the family was, always smiling and thanking us repeatedly for coming to visit them. What did you take away from your experience that you might not have considered before the trip began? This trip made me realize that I enjoyed volunteering and would definitely want to do this again, in India or even somewhere else! Through the Crossover program, I witnessed firsthand how unfair life can be for kids in India, their future often just depended on what family they were born into. Staying in school seems to be not only the best option but the only option for some of the kids. That is what Crossover's mission is and I was glad I could do my small part to help achieve this. The trip also made me appreciative of my life in the US and all of the opportunities I have. I also experienced personal growth through volunteering with Crossover. I am naturally introverted, so being a coach and mentor to the kids took me out of my comfort zone and allowed me to see my potential as an assertive leader. How do you hope to extend your experience into the future? After having a few weeks to reflect on my experience, I am already looking forward to going back to India again next year. In my future trips, I would love to spend more one-on-one time with as many kids as possible to continue to learn more about their daily lives and help them in any way to reach their dreams. I am also looking forward to reconnecting with the kids I worked with this year and see how they have changed and grown. It would be interesting to see if they are still in school and if the mission of Crossover was successful. It was very hard for me to say goodbye to many of the kids that I became close with. A few of the girls that I worked with wrote me thank you and goodbye notes that I know I will keep forever.